Most of us love to cook especially to those who love to eat. For people like that, the kitchen is the most precious part of their home and is willing to spend just to make it the way they want it. 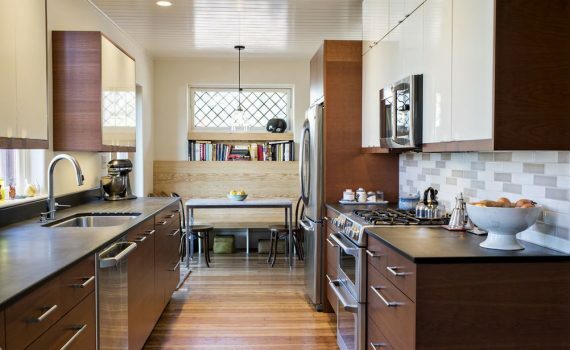 You should know how to make your kitchen give you an at-ease feeling when cooking. Surely, you will walk around getting knives, washing dishes, cutting onions and stuff, and a messy kitchen would only make it harder for you. So here are some kitchen design ideas for you to be able to make your cooking easier than before. Invest in a good knife storage. Knives are one of the kitchen utensils that is most used, and you need to have proper storage of it since there are different kinds of knife. These knives should be properly stored and separated from each other to make it easier for you to identify which type you will use. Take away the cooking utensils on your countertop. If you want your countertop more organized, keep your cooking utensils such as spatulas and whisks off of it. One reason is that they are awkwardly shaped and creates clutter. Put them in a cabinet that you can easily pull out and is near the stove. Invest on the right vent hood. Vent hoods are in charge for sucking smoke while you cook. There are different variations for vent hoods that are formulated for determining how much power it will consume. Choose the right size for your stove because, for vent hoods, size does not matter. If you are using a gas range, you need to invest on a larger power vent hood because it generates more heat. Make a pullout for pans. It is better to put your pans in storage where you can easily identify and get which one you will need. Modern kitchens don’t hang pans anymore as it looks messy stack of pans.